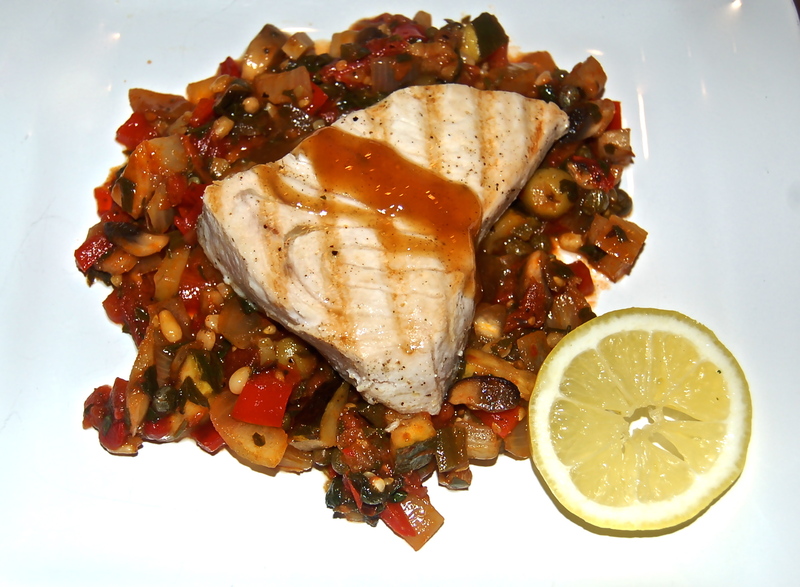 Swordfish is a specie that adapts to endless variations, but for us the simplest method is to be cooked in a sizzling grill pan or on a gas grill for as short a time as possible, then paired with any number of compatible accompaniments. Last evening it was a combination of Mediterranean vegetables brought together in a quick saute. 1. Prepare all the major vegetables in separate bowls. (The Garlic, Fennel & Onion can be in one bowl.) Have all the other ingredients available on hand at the stovetop. 2. Heat 2 TB of EVOO in a large saucepan over high heat. Saute Onion, Fennel & Garlic until soft. Stir in Olives. Set aside in a large mixing bowl. 3. In the same pan add the Mushrooms, Zucchini, Red Bell Pepper & Red Pepper Flakes. Saute for a few minutes & add to the large bowl. 4. In the same pan add the Tomatoes, Capers, White Wine or Vermouth & the Marinara sauce. Saute for a few minutes & return all the ingredients from the large bowl. Add the Salt & Pepper & Parsley & gently toss together. Cover the saucepan. 5. Season the Swordfish steaks with Lemon Juice, EVOO & Salt & Pepper. Set aside to blend the flavors. grill for 1-1/2 minutes a side for rare, 2 minutes for medium rare. Any more will dry out the fish. 7. To serve. Add a generous bed of Salsa to each plate. Top with a slice of Swordfish. Adding Ginger Balsamic Glaze to the fish is optional.